This collection of colored, lithographed circus posters from the 1890's and sideshow banners from the early 1900's shows a variety of events featured in circuses held in Europe and the United States. Sideshow banners advertising many unusual acts are a part of this colorful collection. Highlights include "Alexander's London Flea Circus," with a portrait of Alexander and his tiny performing acrobats, "The Snakepit," and "The Talented Baboons," which shows four baboons in a circus act with one acting the part of an animal trainer. Posters from Ringling Brothers and Barnum & Bailey circuses include "Miss Mabel Stark", the Intrepid Lady Trainer, Wrestling the Now Friendly and Willing Once Terror of the Jungle", and "Miss Beatrice Sweeney, the Human Gyroscope, in Dizzy Evolutions at Whirlwind Speed High in the Air." Several linen posters are also part of this exhibition. "Les 2 Harc" shows a French trapeze act while "Maria Barcaronow & Ses Chiens Boucleurs" depicts a performing dog act. Among the sideshow banner companies represented in this exhibition are Cad Hill, Hill-Schafer Studios, Fred G. Johnson, O. Henry Tent & Awning Company, Snap Wyatt, Boots Signs and Neiman Eisman. 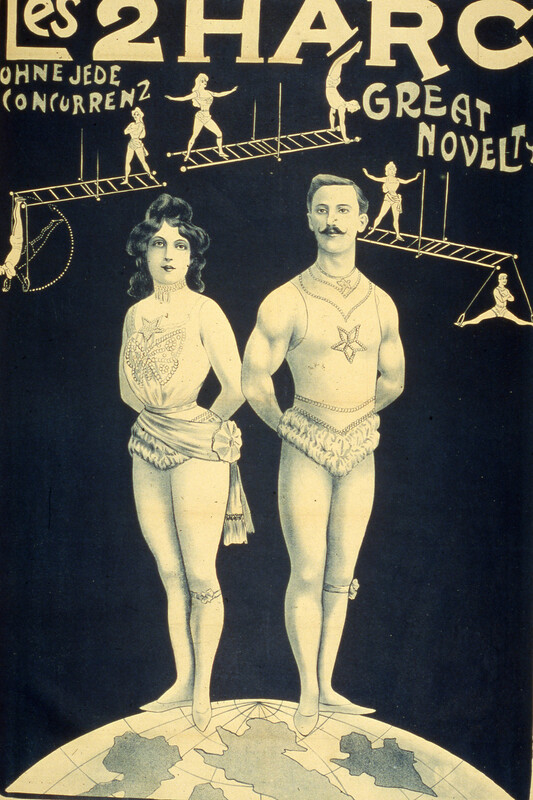 Posters included in the collection are by Cristiani Brothers, Ringling Brothers and Barnum & Bailey, Friedlander, French, Clyde Beatty, Cole Brothers, Hagen Brothers, Robbins Brothers, King Brothers, John Robinsons, Al G. Kelly & Miller Brothers, Gollmar Brothers, Al G. Barnes and Hagen-Beck-Wallace.